Do you know anyone here ? Click to enlarge. We are hoping to identify some people in one of our archived photographs. It is of The Over 60’s Club Outing to Wannock Gardens, near Eastbourne . 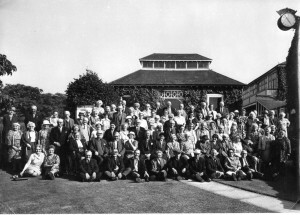 The Club was started in 1962, and this was one of their earlier outings. We know that Dennis Clinker’s mother is on the 3rd row from the front, and 7th from the right. Wannock Gardens was demolished in the 80’s and is now a housing estate.